Banking - There are no banks or ATMs on Kadavu. We therefore recommend to bring some F$ with you. The resort accepts Visa & Mastercard (a 3.9% service fee applies to credit card payments) and of course Fijian Dollar cash. Outside the resort, there are no credit card facilities available. Bar - We have two bars. The Beach Bar opens in the afternoon until dinner and is a lovely spot to view the sunset. The Lounge Bar is open daily from 11.00am to 9.30pm daily. We stock an extensive range of wines, spirits and Fijian beers. Naturally the Cocktail of the Day is always available. Boat & Driver hire is available - by arrangement. Business Services - We have a limited ability to offer business services, after all, we are a dive and holiday resort. Emails can be sent and received at a cost. Because of our remote location, internet and phone services are not as reliable as you might be used to. See also "Internet". Catering - Please advise us in advance if you require anything special. It may be vegetarian meals, a birthday or some other special occasion. Check-in/Check-out - times - Guests may check into their rooms from 2.00pm or earlier if the room is ready. Check out time is 11.00am or as arranged. Church Services - There is a lovely church in the village next to the resort. Guests of the resort are invited to attend the Sunday Services. Dress Code - The resort is a very casual environment. We suggest that you dress to the standard that you would like whilst at Matana Beach Resort but avoid revealing clothing outside the resort. The Fijian people are very modest and we ask that you respect their customs and traditions. You can hire or purchase a sulu (Fijian wrap-around) at the resort. Drinking Water - The resort collects its own water from rainfall for showers, etc. Filtered water is available free of charge and bottled water can be purchased from the bar. Electricity - The resort produces its own power through the day via a generator. For the times that the generator is not running, we operate on an invertor system (and use solar energy for hot water heating). Please ask the staff before plugging in anything that uses a lot of power ie hairdryer. The power is 240 volts/50 cycles. Hire Gear - Dive and Snorkeling equipment is available for hire from the dive shop. Airport - It takes about 15 minutes by boat to get there. Internet - We have Wifi available in the main bure (charge applies). A laptop may be available for limited guest use on request. 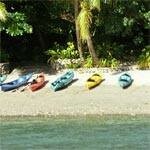 Kayaks - are all available for guest use, free of charge. Laundry - Laundry service available for a charge. Because of the damage that detergent does to the marine ecosystem, we ask you to attempt to minimise your need for laundry. Library - The lounge area has a library of over two thousand paperbacks, hard cover books and magazines for those that enjoy reading. Pool - We have the biggest pool in the world - the Pacific Ocean. Clean sandy base, aqua water, pleasant temperature and no chemicals! Restaurant - Located in the elevated dining area, we serve a variety of local and international dishes. Meals are ordered off the blackboard or buffet style. We always have fresh fish available when it is caught. If you have special dietary requirements, please let us know before your arrival. Telephone Calls - Guest can receive and make phone calls (F$10 phone cards can be purchased from the Resort). Tipping - Tipping is not customary in Fiji. In fact we discourage individual tipping. We have a Staff Fund box located in the office if you would like to contribute. Gratuities are distributed to all the staff, even those that you don't get to see, at Christmas. This is the fairest system and is the way that the chief and elders of the village want to see it done. Transport - Once you are on the island there are very few roads. In fact the only practical way to reach the resort is by water. Trips and Day Tours - We offer a range of special resort activities that include beach picnics, half and full day kayaking, trekking (waterfall trek), sunset cruise and cultural performances.